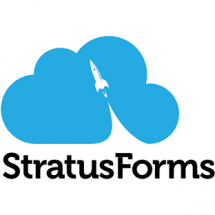 If you’ve ever wondered how to structure your SharePoint sites, you’re not alone. For those that have been doing SharePoint for a while, you may already know that we’ve long had the debate – where do your department sites go in SharePoint? Are they considered publishing sites or collaboration sites? Or both? Are they sub-sites or site collections? How can we structure sites so we secure some content and still publish content for others, without making it too complicated? 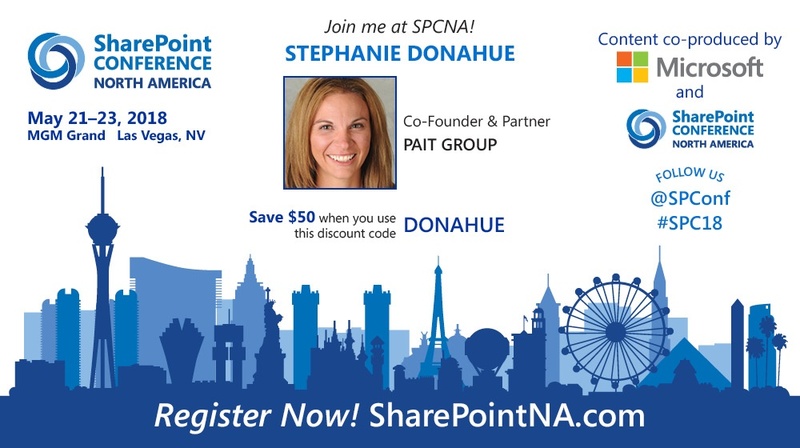 This concern often leads to a successful intranet build, but prevents true collaboration from occurring in SharePoint. We watch as our HR teams, Finance, and others still resist adding their most secure content into SharePoint (and especially into the cloud!) when we know the file share is no longer the best place for that content. 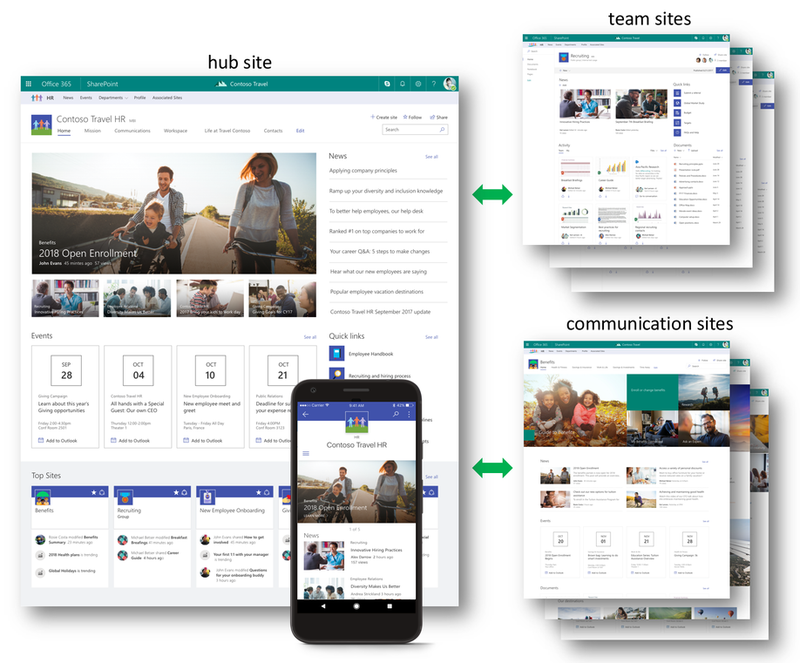 This issue gets even more complex when we bring Microsoft Teams– which are supported by SharePoint sites – into the picture. 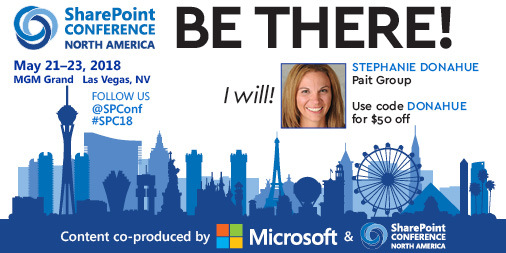 I want to take some time to talk through what is no longer considered a good approach, and then provide a replacement, modern approach to site architecture best practices in Office 365. There was a clear division between the site that is sharing content for others vs. what is secured information for the department (Example: HR provides 401k benefits information to everyone (root sub-sites), but employee reviews need to be locked down to a small group of individuals (site collection)) This limited confusion and security mistakes. If you did more complex branding on your intranet site collection, it was also easier to configure the additional sites and corresponding navigation. Giving your collaboration sites a more basic look and feel also made them easier to manage and contributed to the user understanding whether they were in a secure site or publishing site. Another approach I would commonly see would look something like figure 2, where secure subsites were tucked under the publishing site for simplicity to the end-user. While this was never my preferred approach due to security concerns, I know plenty of organizations who implemented this way. This further complicates the idea of “where does my content belong?” I still consider you among the lucky ones – best of luck to those sorting their way out of the folder and item level security structures! While these approaches worked ‘ok’ in legacy versions of SharePoint, the complexities of managing broken inheritance and moving subsites around during re-organization always kind of haunted us a bit. More importantly, Microsoft has now come out and made a strong recommendation against using sub-sites. This is for good reason!! There is little benefit to using sub-sites in a modern site collection and you should consider it practically unsupported. Yes, you can still create subsites, and you can still break permissions, but do so at your own risk – I’ve heard reports of modern search not working correctly in some of those scenarios. I’ve added references to related blogs at the end of this article if you want to learn more about this significant change in recommendations from Microsoft. At its core though, the idea I believed in is still relevant. *We still want the clear separation of what consists of a publishing site vs a collaboration space* One area, where you would have many readers and few content owners/creators and other areas where you could have many collaborators, without compromising security. So now what do we do? Contoso Marketing department curates the corporate announcements and HR publishes content like the 401k benefits guidelines and links to the health care benefits web sites. We assign Marketing to run the News & Communications site collection (isolated security). HR runs their own Communications Site collection for publishing content about benefits (isolated security). Both of these sites are linked to each other in the navigation (manually). 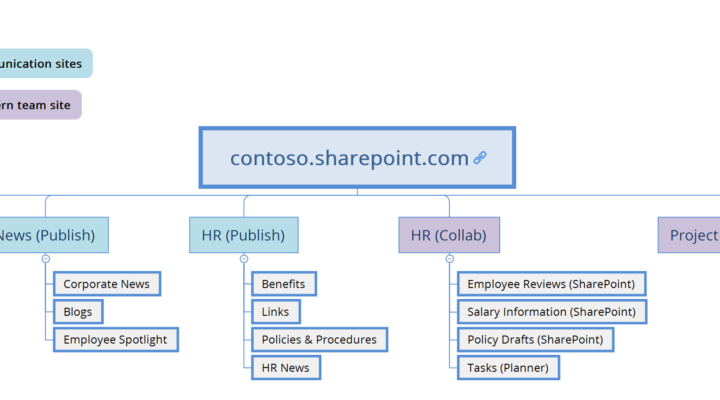 Individually, HR also has a Microsoft Team with a corresponding SharePoint site collection, where they can collaborate on new policies & procedures that no one should see until they are finalized. They can also store secure content like salary information and employee reviews, without concern it will end up exposed in the publishing site. 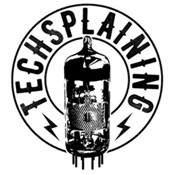 Planning: How do I know when to use Classic sites vs Modern Communications Sites vs Teams? Classic Team or Publishing Site – For the moment, this will still be your root site collection since modern is not available there. Suggestion: Share news rollups with search web parts, provide links to internal and external applications or even embed a video from Stream here! CEO’s love to share their message from the latest TownHall meetings on the home page. Teams may not be department focused – think functionally! How do you work together? You may find that creating Microsoft Teams based on “Projects” are easier to manage! With everything flattened into a single level of site collections, you may already be cringing at the thought of managing the navigation between sites. If you don’t already know, SharePoint doesn’t automatically add navigation for new site collections, only sub-sites. This is a good feature; each site collection is its own secured silo! It’s almost like the site doesn’t exist until you make it visible through navigation. 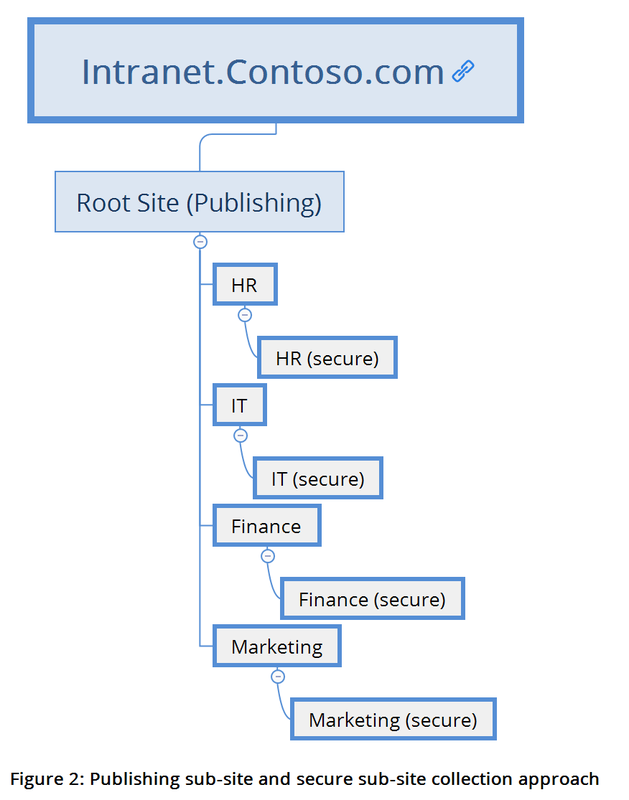 The beauty of this is that if you re-organize and suddenly HR belongs to Operations instead of Corporate, you’re not moving subsites around, you’re just moving links because of your flat site architecture. The down side, is that right now it’s a manual process and can be tedious if you have a lot of sites. If you’re up for some development, you can investigate search-based navigation as an alternative. If this is frustrating to you, don’t despair! Coming soon – you’re going to be able to create automatic navigation by joining the site collection to a Hub site. I haven’t mentioned that here so far because they aren’t available yet. Hub sites will provide a way to bring together related sites – you can roll up news/activity feeds, created a shared navigation, and even share the look and feel of the site. You will be able to add and remove sites from hubs as needed. Your site architecture will still be flat, the sites do not become a sub-site to the hub site, but they will be associated to each other. No more re-organization headaches. What if I’m not ready for Microsoft Teams? Do you have to take this approach? Only if it makes sense for your organization. If you aren’t rolling out Teams yet, then try to create your collab-based SharePoint sites as Modern SharePoint team sites when possible. Your sites can be “groupifed” later so that you can utilize Teams and/or Groups when you are ready. So, don’t worry, you can grow into features as your organization is ready for them. I’m a big fan of rolling out Office 365 in phases. This makes for happy end users and a helpdesk that isn’t overwhelmed. This is a lot of new information for me – where can I learn more? Bob German – What is a Modern Site and Why should I care? You should also be following along on the Microsoft Tech Community Sites https://techcommunity.microsoft.com/ for the latest information, blogs, and support. Finally – I would love to hear from all of you and your experiences with collaborating in Office 365 – the best thing about our community is to learn about what is working for others and apply it in our own way.